I didn’t have high expectations of this book. I’m not that much interested in the so-called new atheists, nor in those who argue against them. And I think the world probably has quite enough books about CS Lewis. But I am interested in the philosophical arguuments generally. And I am a great fan of Lewis – he was a very formative influence on me as a teen and young adult. So I thought I’d read the book more or less for old times’ sake. What has Lewis got to say in 2014? Lewis and Williams are critical of “scientism”, science raised to the level of a philosophy with the claim that sciences can explain all questions, and anything it can’t explain is meaningless. They see this as the revival of the refuted philosophy of logical positivism ( which states that the only statements which have meaning are those which are empirically verifiable). They also critique what they see as the new atheists’ misrepresentation of religion and faith, which they often base on the worst cases they can find. CS Lewis’ Surprised by Joy outlines the way his ‘nostalgic longing’ for something beyond what the natural world seemed bale to offer led him on a journey to eventually find God. Williams discusses this experience, and turns it into a formal philosophical argument, which he tries to defend. I think this is less successful than when Lewis described his own experience rather than present a formal argument. But it remains true that some people, atheist or believer, feel that without God life is meaningless or less attractive – some accept this, others feel it is a spur to search for something more. This is probably the most philosophically well-developed of Lewis’ arguments – if natural processes alone are responsible for the human mind, and natural selection favours genes that increase survival and reproduction, how can we have any confidence that our abstract thoughts are true? Williams argues that neuroscience and the philosophy of mind assume naturalism, but then are unable to explain consciousness. He discusses the many objections to the argument, and the responses which appear to show suggests that naturalism has been unable to explain what we all experience. Lewis argues that if the logical positivism which the new atheists generally follow is true, then no moral judgments can be true, or even meaningful, because they cannot be reduced to empirically verifiable propositions. We may be able to verify the outcomes of certain actions, but we have no basis for saying our judgment about their rightness is “true”. But most of us make moral judgment that we seem to believe are true, so they must come from something more than naturalism. Again Williams discusses all the objections and how Lewis’ thought addresses those objections. Lewis is probably most widely known, and criticised, for the ‘trilemma’ (which he was not the first to state), that when Jesus claimed to be the son of God, he was either a deceiver, or deceived or truly divine. Some counter with the suggestion that Jesus could have been honestly mistaken, while others question the reliability of the New Testament texts about Jesus, especially the claims to divinity. Williams counters by referencing the historical evidence for Jesus, and arguing that no other hypothesis explains the facts as well. 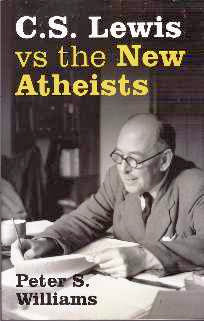 If this book had been just what the title indicated – CS Lewis vs the new atheists – it would have been interesting to Lewis buffs, but of little value to others. But it is much more than that. Peter Williams is a philosopher, so he adds plenty to the argument. But the best part of the book (for me) was the copious references and quotes, from “new” atheists, Lewis and other contemporary christians. It will be a useful reference for me. Anyone who wants to gain a broad understanding of contemporary thinking on these arguments. The arguments haven’t gone away. Occasionally you find atheists saying that all these arguments have been refuted, but they haven’t. They haven’t been proven true either. They remain as matters for discussion by philosophers and ordinary people alike. This ordinary person still finds them to varying degrees persuasive. Others do too, while others don’t. And so the discussion will continue. Read more about how these arguments collectively point to God, in Is there a God? Read more about philosophical arguments.